I have always wanted to try shooting, so when I read in the newspaper that there would be a mobile air-rifle range at the 2014 Coffs Coast 4WD, Caravan & Camping Show I went to try it out. While there, I also had a talk to the guys from the Coffs Harbour Rifle Club and found out that they shoot each Wednesday night in Howard Street. That Wednesday night I went along for the first time and so began my passion for target shooting. I soon joined the club, got my firearms licence and, eventually, a 'permit to acquire' (allowing me to purchase my own rifle). The plan was to initially purchase a rimfire rifle that I could use each week at Howard Street, then get a centrefire rifle later for long-range shooting at Dairyville (which I do once-a-month). After much research and discussion with my new friends from the club, I finally settled on a Savage Mark-II BV rifle and a Weaver Classic-V 6-24x42 Mil-Dot scope. From what I've read online, I understand that a particular rifle will prefer a particular type of ammo (i.e. that will provide the most consistent grouping). I therefore found and purchased 8 different types of ammo all under (or near) $10 per 50 rounds. The plan was to shoot each type of ammo through my rifle and see which one was the best. Once I knew this I could purchase that type of ammo in bulk for future use. I've had the rifle for a few weeks now, but last night I got to shoot it with my new scope for the first time. After zeroing the rifle at 50m (making sure the scope's aligned properly so that it shoots on target) I proceeded to test my 8 different types of ammo. Again, I researched this online beforehand to work out the best way to test the ammo. It turns out that some ammo is lubricated and some isn't. When shooting different types of ammo, there's a chance that residual lubrication left in the barrel can affect the accuracy of subsequent shots. As a result, it's recommend to clear the barrel by making a few test shots whenever you change ammo. 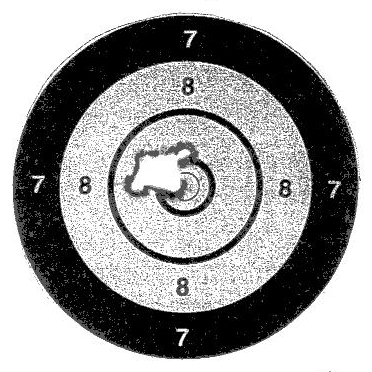 The plan was therefore to shoot the 8 different types of ammo in a specific order and, for each type, to: make 5 off-target shots (to clear the barrel), make a group of 5 shots on one target and then make another group of 5 shots on another target. I would then measure the diameter of both 5-shot groups and calculate the average of that ammo type's group size (the smaller the better). All types worked well for the purposes of testing except the CCI Quiet. It's a lot slower, meaning it's affected by gravity longer, meaning it drops a lot more than other ammo. As a result I was missing the target altogether and ended up giving up on it. I may try it again later (since I've still got a box of it), but it doesn't appear in these results. It seems that SK Magazine is the best performer for my rifle. It was also the only one that gave sub-MOA groups (groups less than one Minute Of Angle in diameter (i.e. <15mm at 50m)).